Bob Catley, the legendary frontman of Magnum, is back with his new solo album. Just before pushing the play buttom (I hope I will have no copyright problem with Aerosmith saying that ;-) ), you imagine full of things : this is the return of Magnum, this album will be a killer, another diamond of melodic AOR will enter in my CD collection. In other words, you put lots of hope before the music even starts. And when you discover that Gary Hughes has written and produced Middle Earth, your imagination runs fast. Actually ... too fast. The music is quite easy to get into, with nice melodies with typical AOR vocals (full of sugar) and the result is equilibrate. However, we have heard that two thousand times before. No magic moments at all (some songs reminds me so much other AOR bands) and my soul doesn't fly at all when I listen to this Middle Earth. I was expecting much better from Bob Catley. Asia, Ten, Steve Walsch, Praying Mantis, Shadow Gallery and of course Magnum have done much better a long time ago. 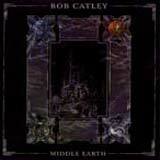 If you are into melodic AOR / Hard Rock stuff, check this Middle Earth, but do not expect miracles.